Posted on August 2, 2018 at 2:29 pm. Once a week, on my commute in to work, I listen to a podcast called Two Bobs that helps agency owners make their agency outstanding. More often than not, the concepts that apply to the highly creative and technical world of online marketing apply just as readily to legal. Quite obviously, being a lawyer is not a differentiator from which a prospective client can select among a sea of potential legal representation. Even being the “best lawyer” is hard to truly assess. This, despite the slew of award icons prominently displayed on legal websites – AV Rating, Avvo Rating, and even entirely fake and bogus paid awards like “Lawyers of Distinction.” In the marketing world, we call these “trust marks” – and they are a visual attempt to convey “best lawyer” positioning. The problem, of course, is that there are a myriad of these trust marks, most of which are completely meaningless to average Joe Consumer. Being “best” is simply a very difficult position to hold – especially in the awards arms race of legal marketing. This extends to the personal injury world where the arms race is self aggrandizing award boasts. “Over $300K recovered…more than a million dollars in awards…largest settlement…” Blah blah blah. It requires courage to embrace the fact that lawyers compete not on the “best lawyer” continuum, but on the, “why should I hire you?” continuum. And the reality is that most prospective consumers know they can’t accurately assess “best” and instead try to answer the second question. Being different is a positioning that transforms the lawyer selection process in the prospect’s mind from, “which lawyer do I want to hire?” to “which person do I want to work with?” And in the prospect’s mind, being different never has anything to do with evaluating lawyers on the lawyerly continuum. Try as they might, lawyers simply can’t be more lawyerly than other lawyers. On the other hand, a lawyer or law firm can be an openly gay lawyer, the expert in self driving vehicles, the immigrant lawyer helping others follow in her footsteps, the city’s oldest law firm, the lawyer who used to be a cop/prosecutor/in-house at Allstate, the law firm supporting black lives matter, the state’s largest law firm, the athlete who organizes local road races and happens to practice law (h/t to Turkowitz), the tech nerdy paperless firm, the ex JAG, or the small town lawyer who grew up just a mile from his current office. To the right prospect, each of these differentiators above is much more personally appealing than sifting through countless lawyer profiles trying to identify the better best bestestest most lawyerly lawyer lawyer. Because, sometimes, its better to be different than better. Posted on May 30, 2018 at 6:30 am. Today, Mockingbird Marketing is proud to announce the new Mockingbird! In a little more than 5 years, we have grown from the stereotypical startup to a top-tier, full-service law firm marketing agency. Our mission and values have always stayed the same, but our capabilities and services have evolved. We’ve come so far that we decided to officially relaunch the brand. Welcome, to the new Mockingbird. Our new logo is custom made by our lead in-house designer. The wings are two M’s for Mockingbird Marketing. The bird is no longer standing still, but flying upward to represent the speed and agility of our agency. The curved, modern design reflects the smooth and polished aspect of our boutique level of service. With the new logo comes a new website. The clean, consistent design follows our brand guidelines while the backend development focuses on speed and stability. Of course we’re going to use this as an opportunity to showcase our best work, but more importantly, our site is meant to help law firms grow. We have resources, webinars, speaking events and blog posts with the latest law firm marketing strategies. Whether it’s as a client or as a newsletter subscriber, our job is to make law firms successful. As Mockingbird has grown, our tagline has evolved from “Search Experts” to “VP of Marketing” to “Outsourced Marketing Department.” Our level of service is rising, and our solutions are expanding. We’ve made invaluable partnerships around the industry, including a very important partnership with Google. As Premier Google Partners, we have been able to send teams to train at Google and bring back the latest marketing strategies. Our knowledge as an agency continues to grow, and our team is truly greater than the sum of its parts. When you hire Mockingbird, you don’t just get a “Search Expert.” You get all of us. Your Account Executive will work with you to develop marketing strategies, we’ll have Marketing Managers implement technical SEO changes, you’ll get a Paid Search Manager to handle your advertising, and our design and development team will create websites, display ads, and custom imagery whenever you need. This is how we built the new Mockingbird brand – as a team of experts. With the new logo, more polished branding, and updated website, we are excited to officially relaunch Mockingbird. Our agency has grown, and our brand has evolved. We will continue to provide marketing solutions for law firms across the country, but now we have a brand, a logo, and a website that reflects our industry leading level of service. Posted on January 16, 2018 at 12:29 pm. Posted on September 13, 2017 at 10:00 am. Mockingbird, a company with a long list of clients each with at least a few dozen logins, has recently decided to enlist the help of password management software. After doing our due diligence, we decided to go with LastPass. Here are 5 reasons we won’t be giving up LastPass any time soon. Easily the biggest selling point for us was how easy LastPass makes sharing passwords across a team. Before LastPass, Mockingbird had a big sheet with logins to every tool we use (Google Analytics, AdWords, Ahrefs, Majestic, Yext, etc. ), and a file for each client’s individual login info. Whenever a password needed to be changed or updated, the person responsible had to go in and make sure the change was recorded in our records, which was a hassle and inevitably opened the door to human error. Now LastPass does all this for us. Whenever a new account is created and username/password are submitted, LastPass asks “Add to LastPass?”. Clicking edit will present a dropdown containing each folder you and your team have made. For us, these folders are organized by client (shared across team), tools (shared across team), and personal login info. 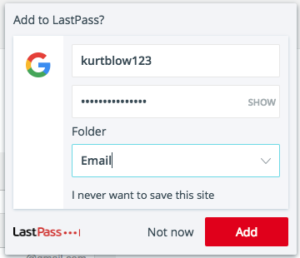 Once all of your passwords are in one place, the LastPass browser extension autofills username/password wherever you need it, eliminating the need for your own messy password files. Convenience aside, LastPass encourages secure online practices. With major security breaches making headlines more and more, the importance of online security is more urgent than ever. LastPass works from the premise that having one username/password combination for each of your many accounts across the web is common, and dangerous. LastPass facilitates the process of individualizing your passwords for each of your accounts. Yes, you do need to log in to each of your accounts (for now) and change your password. Change your password to what, you may ask? LastPass provides a secure password generator in its dashboard for your use. Once you’ve saved your new, unique password to LastPass, that’s it. LastPass removes the immeasurable hassle of managing your new, unique, and very secure passwords on your own. Once your new password is in LastPass, LastPass will autofill as you go to log in to any one of your accounts. Not sure how strong your passwords are? LastPass provides a password strength audit to measure the strength of each password you’ve submitted to LastPass. This tool is a good reminder not to use LastPass only for convenience, rather than security. If you get LastPass, download the browser extension, and add each of your existing username/passwords to LastPass, odds are you’ll stumble across this tool and realize your security is still abysmal. LastPass manages your passwords, but it’s still up to you to make sure that it’s managing good passwords. This last one is more just icing on the cake than anything. LastPass offers a limited (but entirely sufficient) version to individuals for free. If you take advantage of this for personal use, you’ll notice that your personal and company accounts can be synced with the click of a button. This means that once you’re logged in to your master LastPass Account, you can log in to every account you’re concerned with easily. To summarize, LastPass has made our lives at Mockingbird just a little bit easier. If you take the time to lay down the groundwork and use LastPass right, it ends up saving you a lot of time and headache. Posted on September 11, 2017 at 9:01 am. So…. Since starting Mockingbird, we’ve never proactively sought business. For the most part it has come to us. BUT…. I’m now proactively looking for more immigration attorneys to add to our client list. Over the past two years, we have locked down online marketing for a handful of immigration attorneys. And at the risk of making this sound like I’m selling a set of steak knives or a used Ford Taurus – its an easy, repeatable, fool-proof system that has delivered stupendous results. Here’s another situation – where we’re driving close to 10 calls per day to a small immigration firm. We’ve spent a large amount of time (and money) learning what works and what doesn’t in Immigration. Much of our effort and experience and learnings are generated from the hypercompetitive markets of Personal Injury, Mass Torts and Criminal Defense. Simply applying the best practices from those aggressive and overcrowded markets to the less competitive and frequently more distributed immigration market is all it takes to make a huge impact. Posted on July 11, 2017 at 9:21 am. As a business owner, I’ve mostly eschewed getting political online. That ends now. 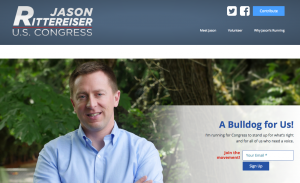 Today we announced the candidacy of Jason Rittereiser in his bid to unseat a Republican incumbent in Washington’s 8th Congressional District in the upcoming mid-term elections. Seventeen years ago, I came to Seattle a die hard, life-long conservative and have found myself slowly leaning towards the center ever since. In 2004, I posted a “Republicans for Kerry” bumper sticker on the back of my VW Jetta. I was thrilled to brush shoulders with Obama at his WA campaign headquarters, which coincidentally was next door to Avvo’s second office. Last year, I notched a protest vote for Jill Stein. I’ve increasingly found myself drawn to what I would have formerly called bleeding heart causes and have often wondered if its a product of the sea air, proximity to Mt. Rainier, or something they put in the chai lattes at Starbucks. There’s a great line in Inherit the Wind, “maybe it is you who have changed, by standing still.” I’ve come to the conclusion that the shift in political standing isn’t because of my personal changes, but because the conservative landscape has shifted so much underneath the country. I find today’s political miasma nauseating and I look forward to playing a small part in return a semblance of balance to the political system. Thus my deep pride to be working for Jason’s campaign. I’ll continue to fly my American flag regularly (unlike the majority of Seattleites – seriously you should consider how much it means to people in the service to see those flags flying, but I digress…) and now have a chance to turn Mockingbird’s skills towards the political process. We are providing technical support, design services and of course marketing. I’ve always encouraged Mockingbird’s clients to embrace their true self in their public persona, as I’m 100% certain that people hire people who happen to be lawyers, instead of the other way around. Its past time that I ate my own dogfood…. You can (and should) read more about Jason. More to come (and if you happen to be in the greater Washington area, expect fundraiser invites from yours truly). Posted on April 21, 2017 at 10:00 am. Here at Mockingbird, we like to do things the right way, and from our humble beginnings, we’ve always thought operating on a four-week basis gave us an edge over the competition. We preached data consistency and argued that the number of days in a month don’t always match up. However, we’ve found that four-week periods still have inconsistencies like holidays and seasonality. Also, sending out invoices every four weeks caused problems with everyone’s accounting departments. Mockingbird is happy to announce that we are changing, and we’re hoping this change will make everyone’s lives just a little easier. After numerous requests and some self-reflection, we are moving away from four-week periods and are transitioning to a monthly cadence for reporting, billing and invoicing. We are all used to receiving bills on the same day every month. Comparing March to February is easy to understand. Operating on four-week periods made sense in theory, but moving to a monthly cycle makes sense in real life. For our current clients, your Account Executives will be connecting with you to discuss what this change means for your specific billing needs. As always, please feel free to reach out with any questions you may have. Posted on March 1, 2017 at 4:49 pm. What: Webinar with Google addressing advanced targeting features in Adwords – bring any and all questions you have about your own campaign.